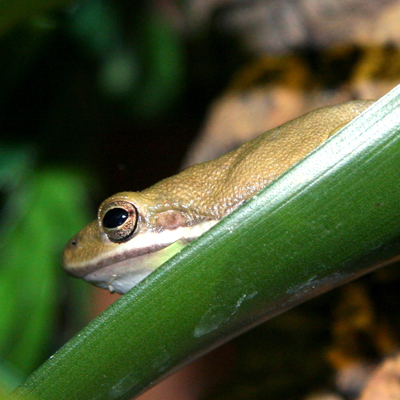 The American Green Tree Frog is a common species of new world tree frog. It originates from the south eastern parts of the USA and is the state amphibian of Georgia and Louisiana. They are usually found around small ponds, lakes and marshes, hiding in the vegetation and feeding on a variety of small insects. The American Green Tree Frog is a medium sized frog around 6cm long and usually bright green in colour. Depending on light and temperature, their colour can change to dark green or brown. These frogs make a good starter frog as they are easy to care for, but they must be provided with the correct environment to thrive in captivity. They require high humidity and a large terrarium and as they have sensitive skin, should not be handled unless necessary. When handling is required, gloves should be worn.